It was a sports event summer!! 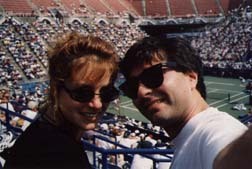 Theresa and I went to the U.S. Open tennis matches in Flushing Meadow, NY. We also went to a Mets game at Shea Stadium, where I made a new friend. Oh, we also went to Central Park. Here is the newly-renovated grounds at the U.S. Tennis Center. Nice! 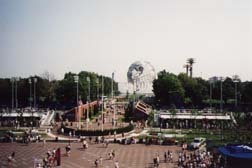 You can see the Unisphere from the '64 Worlds Fair in the background. Here we are in the new Arthur Ashe tennis stadium. This was taken below the upper level of Arthur Ashe Stadium. 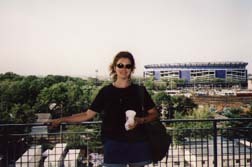 You can see Shea Stadium next door. 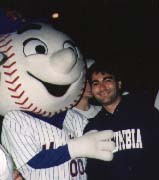 Here I am with Mr. Met at Shea Stadium. Excellent!! 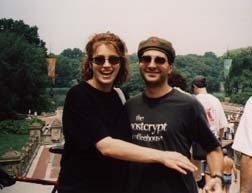 Here we are in Central Park after the free Ashley MacIsaac show at Summerstage. I am wearing my Che Guevara hat.